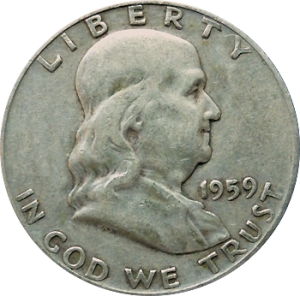 Minted from 1948 to 1963 the Franklin Half dollar is a popular choice for those wishing to invest in silver half dollars from the mid 20th century. 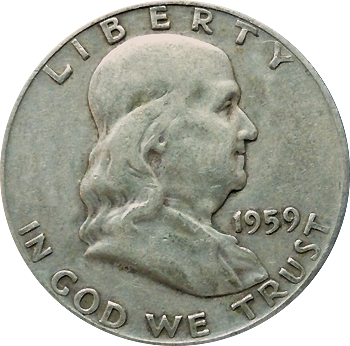 This coin is 90% silver and has a current melt value of $5.42 Ben Franklin Half Dollars can still be found in circulation although they are rare. While not the most popular nor the most valuable of collectable coins, the (Ben) Franklin Half Dollar is still an important part of American coinage history. Owing to the fact that Congressional action is required to replace coins unless it has been in service over 25 years, when the Walking Liberty Half Dollar and Mercury Dime came up for replacement in 1941, the United States Mint was embroiled in other problems because of World War II. After the war, the Mercury Dime was replaced by the Roosevelt Dime as a tribute to fallen President Franklin. D. Roosevelt. This meant the only coin Mint Director Nellie Taylor Ross felt could reasonably replace was the Walking Liberty Half Dollar which circulated from 1948 until 1963 when it was replaced with the Kennedy Half Dollar. The Franklin Half Dollar wasn’t totally without controversy. The artist who produced the design, John R. Sinnock, had placed his initials on the cutoff at Franklin’s shoulder which led some to write letters stating the letters were a tribute to Joseph Stalin. On the reverse, the small eagle (required by Congress on any coinage larger than a dime) caused the design to be disapproved by the Commission of Fine Arts. Since the Commission of Fine Arts was only acting in an advisory manner, their disapproval was ignored and the coins began circulation on April, 30, 1948. As was the standard at the time, the Franklin Half Dollar is 90% silver and 10% copper and weighs in at 12.5 grams. It is 30.1 millimeters in diameter and was minted in Denver, San Francisco and Philadelphia. The mint mark is located on the reverse at the top above the Liberty Bell in the center. The most collectable of these coins is what is known as the “Bugs Bunny” 1955-P which apparently shows protruding teeth and a detached nose. This was caused by a “die clash” which results when damage occurs to the die when the obverse and reverse dies strike together without a planchet, or blank coin, between them. While not significantly more expensive than a standard high grade Franklin Half Dollar, these still command a premium.